Apparently there was a sale on brewing equipment this month. That seems to be the most valid explanation for the fact that a handful of Ontario breweries all opted to up their capacity and production capabilities this past couple weeks by adding a considerable amount of volume to their respective brewing operations. 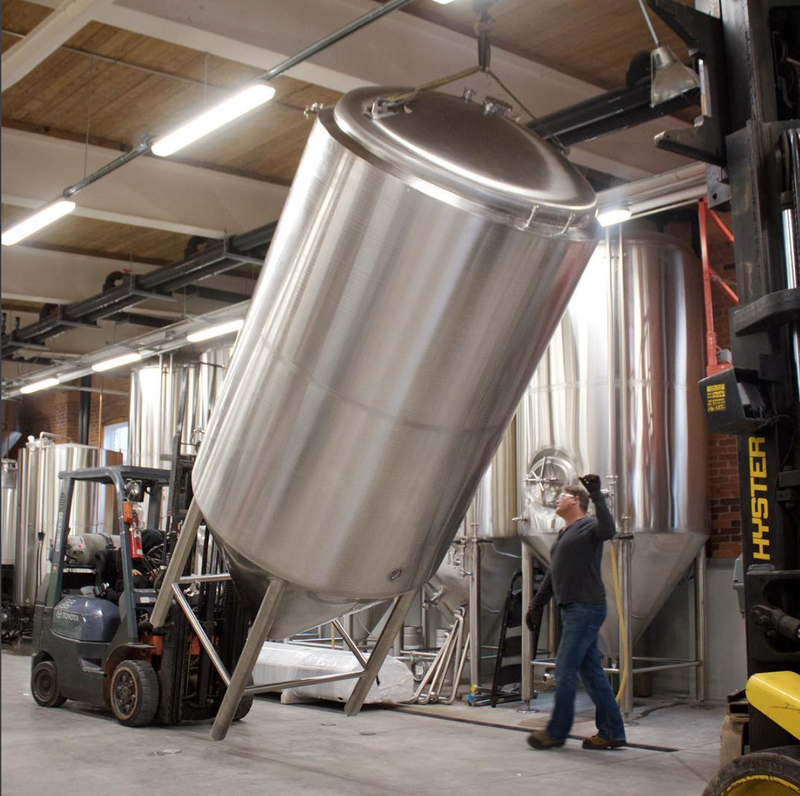 Toronto’s Muddy York Brewing upped their capacity by 33% this week when they got in three new 7bbl (10hL) jacketed fermenters. Owner Jeff Manol tells me that this will give him the ability to lager things a bit more and do some bigger beers that can age (yay and yay). He hopes to have the new tanks in once they repaint their floors and finish the new glycol lines, and after that he says the company is set to build their taproom bar and hopefully have a tasting room open by June at the latest. Nice. Left Field Brewery, also in Toronto, celebrated a fourth anniversary this month by not only coming to visit me (and other people) in London for an 11-tap takeover at Pub Milos, they also put in three 40bbl (40!) fermenters and a 40bbl brite tank–upping their game from five fermenters and one brite. NICE. Great Lakes Brewery, who has deservedly enjoyed much fanfare in honour of their 30th anniversary, has been fairly public about the addition of a new 7 bbl pilot system and ran a series of collab brews to celebrate their birthday that filled their four new 15bbl fermenters (all with beer that will come out this month). What you may not have known though is that the brewery then went out and bought three more fermenters for this system, meaning that they will now have a total of seven 15bbl fermenters devoted just to the beer being made with the new pilot system and they also bought four more 100 bbl fermenters (!) for their full scale system (read: Canuck and “Tank Ten”) and their production and packaging team will now being doing shift work–which means more packaged GLB goodness for all of us. SUPER NICE. Lastly, Collingwood brewery Side Launch, recipient of the 2016 Canadian Brewing Award for Canadian Brewery of the Year shipped in ten new 140 hectolitre fermenters (!!) on February 23rd, essentially doubling their capacity. Effin’ super NICE. This obviously all represents a fairly substantial amount of increased beer volume that is about to hit the Ontario market from some frankly excellent Ontario breweries. And while this is undoubtedly excellent news (lots more great beer for everyone!) it is of course my duty as a snarky blogger to put a negative spin on everything, so I’ll add simply that I don’t know where all this added capacity is going to go (Except in my mouth, bro! *high fives self*). Brewers are already competing heavily for shelf space in the LCBO, are often hesitant to pay the Beer Store to enter their system and, presumably, don’t sell enough at their onsite retail sites to justify this much volume, so facing so much more beer into an already-stressed retail system almost feels like this means something has to give. And if not now then soon. This is especially true when you factor in the fact that yet-to-brew-onsite Kensington Brewing Company is about bring a 15 hec system online in May (fingers crossed), MERIT is under construction in Hamilton, the absolutely massive Cowbell Brewery in Blyth is about to open a 50 hec, four vessel brewhouse (that is not a typo). Bench Brewery is also under construction, and Bim Lafontaine is working away at Godspeed brewery, and probably two places just opened in Toronto’s West end as I wrote this blog post. SO WHERE IS THIS BEER GOING TO BE SOLD? The best case scenario is of course that all this great beer that’s about to hit the market will flood Ontario in such a way that demands a change to our retail system we’ll see Ontario’s craft brewers granted the ability to open their own stores. Or maybe it just means there’s lots of great beer in Ontario these days. What the hell do I know? Drink up! Categories: News | Tags: cowbell brewery, Great Lakes Brewery, Kensington Brewing Company, Left Field Brewery, MERIT brewing, muddy york brewing, side launch brewery | Permalink. Wouldn’t be surprised if a lot of these breweries offer mail order sales,especially if they can’t get in the Lcbo, grocery stores or The BS. Am still waiting for Bellwoods to offer that. Or they may start to push beers out to other provinces. I noticed when I was back in Nova Scotia in the summer they had Side Launch Mountain Lager in the NSLC. (I even think there were a few Amsterdam beers as well.) And I think at one of the private liquor stores in Halifax they had a GLB product, Sunnyside IPA, if my memory serves me correctly. There may be a change when we kick the Liberals out of office.